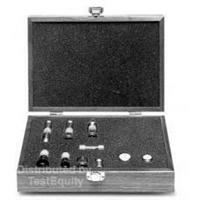 The Agilent 85036B calibration kit contains precision 75 ohm type-N standards used to calibrate Agilent network analyzers for measurement of devices with 75 ohm type-N connectors. Standards include fixed terminations, open circuits, and short circuits in both sexes. Precision phase-matched adapters are included for accurate measurements of non-insertable devices. This kit is specified from dc to 3 GHz.